We could have gone for that doorway in Notting Hill… but we figured there’s plenty of love in the air beyond the Big Smoke – so skip out and let your heart skip a beat over these iconic romantic locations! Set your alarms for ‘golden hour’ and make your way to the coastline, for some wistful gazing into the horizon. 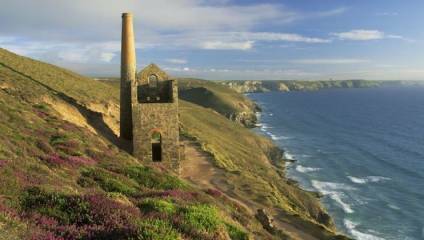 There are plenty of Poldark locations to be found in Cornwall, but St Agnes Head is a good place to start – a gorgeous coastal area steeped in mining history, with the relics of this bygone industry still visible along and a ruined harbour at Trevaunance Cove nearby. To the east of Beatrix Potter’s beloved Lake District lies the Carlisle to Settle railway, a 72-mile line of spectacular views of Dentdale, which takes you over Arten Gill viaduct that featured in the movie. The railway is perhaps the most iconic setting for the film’s romantic pairing: Beatrix Potter (Renee Zellweger) and Norman Warne (Ewan McGregor), who part with a kiss on a railway platform. Ok, so we know that Pemberly was literally based on Chatsworth House. But how about the romance of a whole charming Austen-esque village? Chilham in Kent was where the BBC filmed their adaptation of Emma, starring Romola Garai as the titular anti-heroine. Put your match-making skills to the test in this picturesque village – or better still, try one of their gorgeous pubs, like the Woolpack Inn. We’re back in Cornwall – and about time too! This time-travelling rom-com by Richard Curtis features various London spots, but also some gorgeous footage filmed down in the South West. Porthpean House is a holiday home that was the Lake family residence in the film. You can also visit the St Michael Penkivel Church, where *SPOILER ALERT* they get hitched, in a small village three miles southeast of Truro. Anthony Minghella's acclaimed BAFTA-winning tale of love and loss, which starred the late, great, Alan Rickman, used Bristol as a stand-in for London in various scenes. Goldney Hall – part of Bristol University – was used as the café where Nina (Juliet Stevenson) meets Mark (Michael Maloney) and Birdcage Walk, an arched walkway through a graveyard in Clifton, also made an appearance.